Stichting Drio has organized a multiplier event for the project in the most popular theater in Eindhoven. The event was planned as a debate with a discussion panel present. More then 50 people from different schools, education organizations and parents have joined. The debate started with a painting exhibition which is called ` Me and My Father`. Here some pre/post children paintings are presented. People enjoyed the exhibition with drinks and delicious food. The debate program included two parts; one was to present the project results and some lecture/presentations parts. 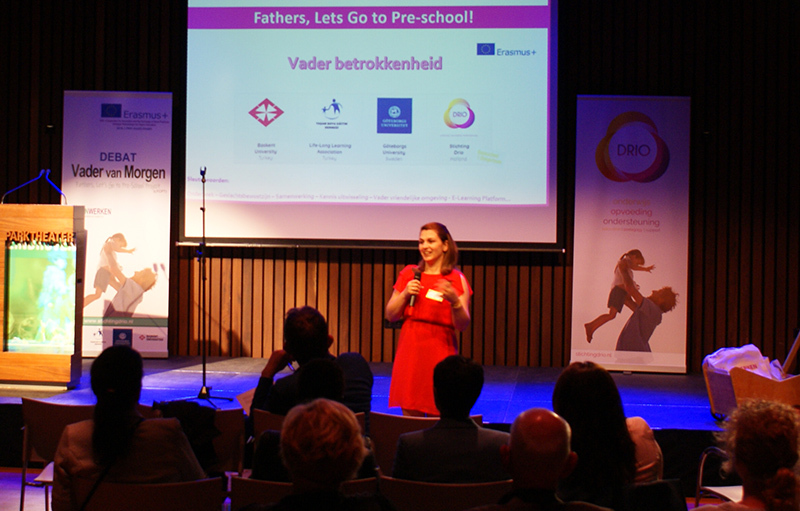 The parent involvement specialist who came over from Utrecht was the main speaker of the evening. The guest speakers of the evening with education background did have presentations and there was a special father with a special child who shared his experiences about father involvement. The second part of the program was a father involvement discussion. The moderator for the discussion was a journalist from a popular newsletter in Eindhoven. With smart questions he has motivated the audience to discuss and share their opinions and reasons, the importance of the father involvement project and the solution ideas for increasing the father/parents’ involvement. At the end of the event, there was a closing event for the guests, with additional room for discussions while enjoying some drinks and finger food. The event included live online streaming and was watched by 1382 people via social media.